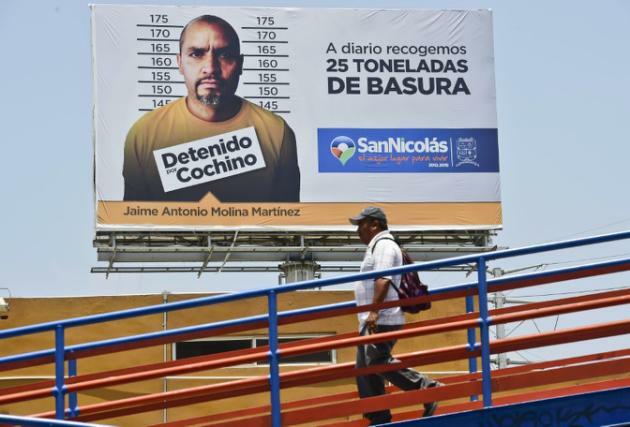 MEXICO: A northern Mexican town has taken a drastic step to punish litterbugs: placing their mugshots on billboards with the words "detained for being a pig." The first public shaming took place on Wednesday in San Nicolas de los Garza, a suburb of the industrial hub of Monterrey, where a stone-faced, bald man's picture and name towered over the street. The sign said the municipality picks up 25 tonnes of trash every day. The punishment will be meted out against those caught littering three times. They will also face a fine and an administrative arrest in a police station. "They will be punished by putting their picture and complete name on the billboards of shame," Mayor Pedro Salgado told local media. "We have to change the culture of cleanliness in the municipality," Salgado said, defending the move when asked whether human rights were violated by such punishment. In Mexico, dump trucks make their rounds in the morning, ringing a bell so that people can take out their trash. But many leave their garbage on the street overnight. Salgado said that much of the trash in the streets blocks sewer and drainage systems, causing floods during rain season.